Stir fry the mushrooms and the garlic for 5 minutes in half of the butter. Add the sherry and the stock and pepper and salt to taste, simmer for 5 minutes. Dissolve the corn starch in a little water, add it to the mushrooms and heat while stirring until the mixture thickens. In the meantime, fry the pork chops brown on both sides in the remaining butter. Distribute the sauce on top and simmer on low heat for 20 minutes. 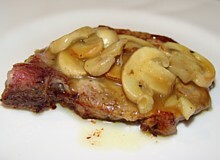 "Kotleta pokrestyansky" means pork chop with mushrooms. On 26 April 1986, Belarus remembers that on this date in 1981 the Chernobyl nuclear plant accident took place. The radioactive contamination has taken high tolls with regard to lives, health, and quality of living. 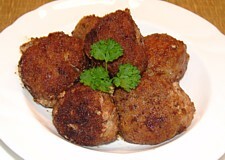 Click on culinary calendar for more links between history and cooking. Stir fry the onion, chillies, ginger, coriander, garlic and cinnamon for a few minutes; grind this together with the lamb meat. Add the eggs and salt to taste. Make 12 balls out of this mixture and rol them through the breadcrumbs. Fry them a few minutes on all sides. Burkina Faso changed its name from Upper Volta on 4 August 1984. It became independent on 5 August 1960. After struggle between Great Britain and France, the country had become a French protectorate in 1896. Click on culinary calendar for more links between cooking and history.